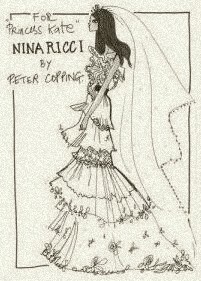 This is a design suggestion for Kate Middleton - by Nina Ricci. Celebrity weddings (and wedding gowns) that have inspired! ...and continue to inspire... Be it expensive, OTT, long lasting, or cheap and quick... We have been entertained by celebrity weddings for as long as we can remember. They inspire us ...and sometimes disgust us, but boy, they sure can be original! It remains up to the individual to live their dream. Bridal fashion has always been here. It is yours … IF you want it!